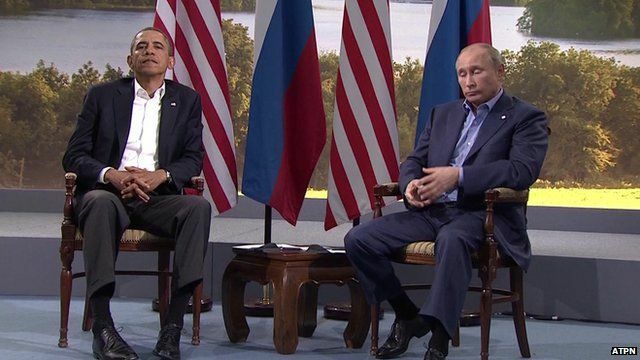 Obama and Putin in 'tense' Syria talks Jump to media player US President Barack Obama and Russian President Vladimir Putin have held a "tense" fringe meeting on the edges of the G8 summit to discuss the conflict in Syria. 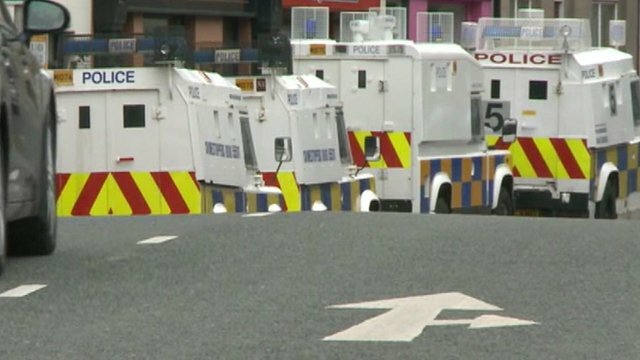 Syria crisis topping agenda at G8 Jump to media player The leaders of the world's eight main industrialised nations have gathered in Northern Ireland for a G8 summit likely to be dominated by the Syrian conflict. 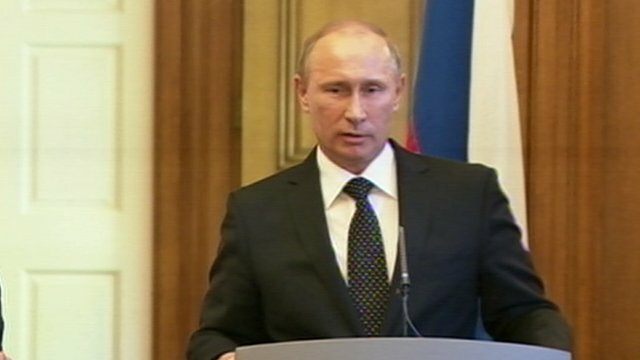 Russia 'not breaching law on Syria' Jump to media player Russia is not breaching any laws by supplying arms to "the legitimate government of Syria", the Russian president has said. 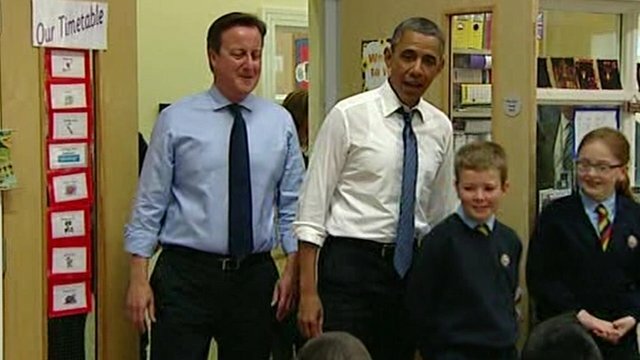 Obama fever comes to Belfast Jump to media player The G8 summit marks the first trip to Northern Ireland for President Obama and he used the trip to praise the peace process saying "it gave the world hope". 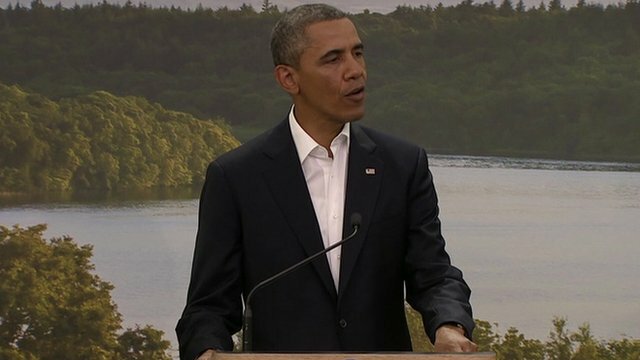 Obama confident in US-EU trade talks Jump to media player President Barack Obama and European leaders launched negotiations on a vast free trade pact between the United States and the European Union. 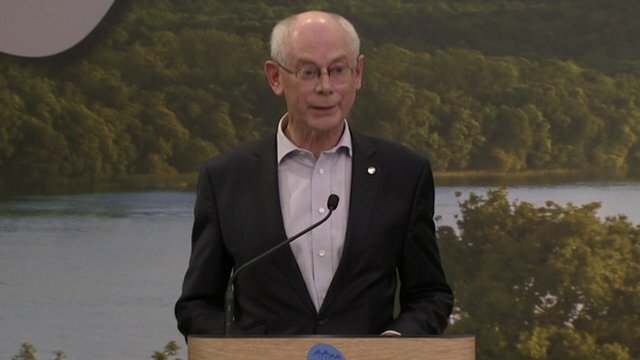 Van Rompuy: Atlantic deal 'is future' Jump to media player David Cameron, Barack Obama, and the leaders of the European Commission and Council, have unveiled an agreement to open negotiations on an EU-US trade deal. 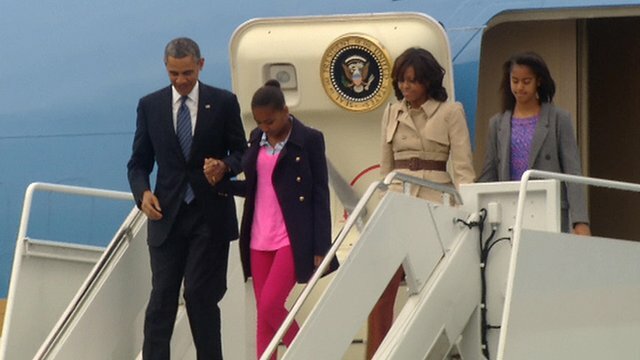 G8: Obamas arrive on Air Force One Jump to media player The US President has arrived in Northern Ireland ahead of the G8 Summit in Lough Erne, Enniskillen, on Monday afternoon. 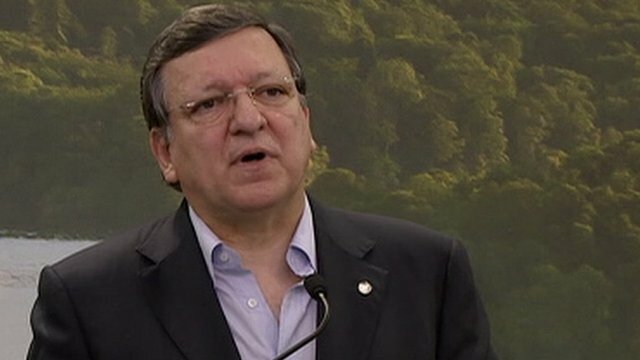 Barroso hails EU-US trade talks Jump to media player Jose Manuel Barroso has hailed EU-US plans to negotiate "a comprehensive transatlantic trade and investment partnership agreement". Inside half-empty G8 protest camp Jump to media player World leaders are gathering in Northern Ireland for a G8 summit and a very small 'tented village' of protesters has been set up. 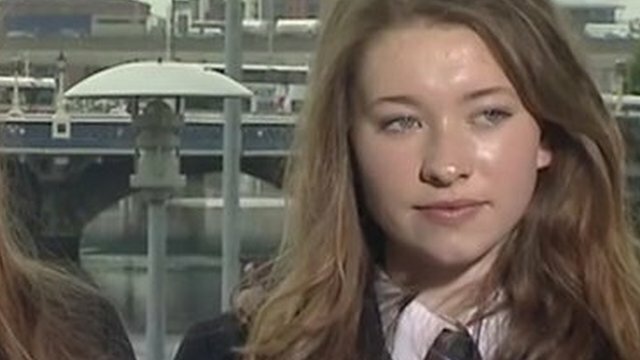 'Obama will stay with me forever' Jump to media player Belfast college student says 'Obama will stay with me forever' after the US president's speech ahead of the G8 summit. 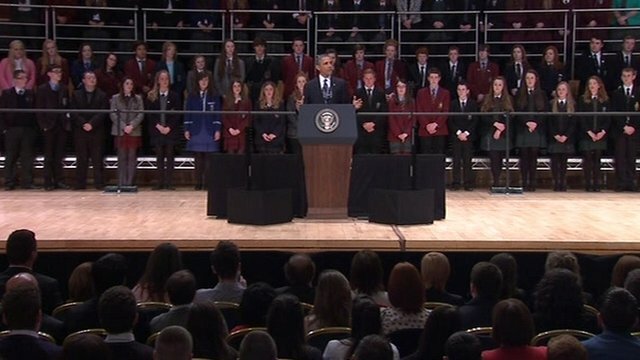 President jokes with Belfast audience Jump to media player President Obama poked fun at his golfing skills by saying Rory McIlroy offered to help the president "get his swing sorted". Police line route to G8 summit Jump to media player Police officers from across England and Wales have joined officers from Northern Ireland to provide security at the G8 summit. 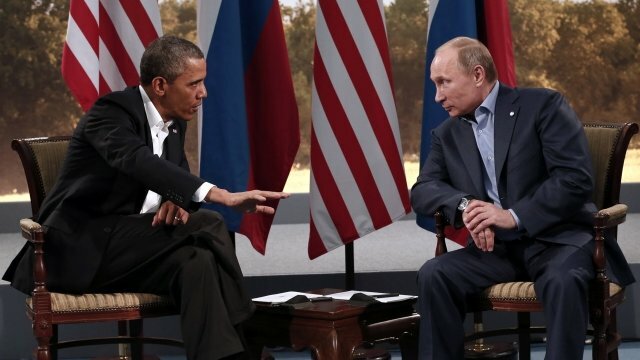 US President Barack Obama and Russian President Vladimir Putin have held a "tense" fringe meeting on the edges of the G8 summit to discuss the conflict in Syria. They acknowledged their differences over the civil war but said they shared a common determination to stop the violence.